As I end my journey on the Reuben Lakser, I wanted to prepare a post about the people on the ship. As in any organization, there are a lot of different people and personalities on board. I interviewed 15 different people and, looking back, I am particularly amazed by how much “Science” drives the ship. The Chief Scientist is involved in most of the decisions regarding course corrections and the logistics. It is really promising as a science teacher — NOAA offers a place for those interested in science to enjoy many different careers. 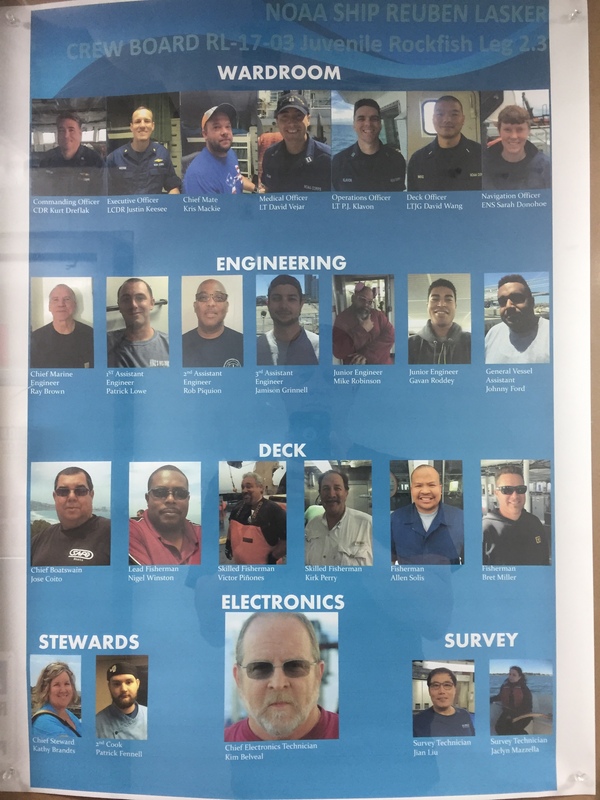 The people working on the ship can be grouped into broad categories. I have mentioned the science crew, but there are also fishermen, deck crew, engineers, stewards and, of course, the ship’s officers. If you like to cook, there are positions for you here. Same thing if you want to be an electrician or mechanic. Each of those positions has different responsibilities and qualifications. For example, the engineers need proper licenses to work on specific vessels. All of the positions require ship specific training. For some, working on the ship is almost a second career, having worked in the private sector or the Navy previously. Kim Belveal, the Chief Electrical Technician followed this path as did Engineer Rob Piquion. Working with NOAA provides them with a decent wage and a chance to travel and see new places. For young people looking to work on a ship, these are great jobs to examine that combine different interests together. All of the officers on the ships are members of the NOAA Commissioned Officer Corps, one of the nation’s seven uniformed services. They have ranks, titles and traditions just like the Navy and Coast Guard. Commander (CDR) Kurt Dreflak, the Commanding Officer, or CO and Lieutenant Commander (LCDR) Justin Keesee, the Executive Officer, or XO, are in charge of everything that happens on the Reuben Lasker. 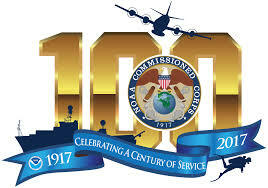 To reach these positions, someone must work hard and be promoted through the NOAA Corps ranks. They make the ultimate decisions in terms of personnel, ordering, navigation, etc. The XO acts as most people think a First Mate would work. What impressed me was how they responded when I asked about why they work for NOAA and to describe their favorite moment at sea. They both responded the same way: NOAA Corps provides a chance to combine science and service – a “Jacques Cousteau meets the Navy” situation. They also shared a similar thought when I asked them about their favorite moments at sea – they both reflected about reaching the “Aha” moment when training their officers. This is definitely something I can relate to as a teacher. Other NOAA Corps officers have different responsibilities, such as the OPS or Operations Officer, and take shifts on the bridge and on the deck, driving the ship, coordinating trawls and keeping the ship running smoothly in general. Most of the NOAA Corps has a background in marine science, having at least a degree in some science or marine discipline. When I asked them why they decided to work for NOAA, the common response was that it allows them to serve their country and contribute to science. Again, this is an awesome thing for a science teacher to hear! To emphasize how important science is to the organization, two NOAA Corps officers, LTJG Cherisa Friedlander and LTJG Ryan Belcher, are members of the science crew during this leg of the Juvenile Rockfish Survey. They worked with us in the Science Lab, and did not have the same responsibilities associated with the ship’s operations. What is your role on the ship? I used to be the junior officer on board, now I am sailing as a scientist for the lab. It is kind of cool to have sailed on the ship in both roles! They are very different. How long have you been working on the Reuben Lasker? Why did you choose to work on the Lasker? I originally listed the RL as one if the ships I wanted after basic training in 2012 because it was going to be the newest ship in the fleet. It was very exciting to be a part of bringing a new ship online. I got to see it be built from the inside out and helped order and organize all of the original supplies. The first crew of a ship are called the plankowner crew of the ship, and it stems from olden times when shipbuilders would sleep on the same plank on the deck while they were building the ship. It is a big task. What is your favorite moment on the ship or at sea? I was the first Junior Officer the ship ever had and got to plan and be on board for the transit through the Panama Canal! Why do you work for NOAA? I love my job! I come from a service family, so I love the service lifestyle the NOAA Corps offers while still incorporating science and service. I like that every few years I get to see a new place and do a new job. Next I head to Antarctica! If a young person was interested in doing your job someday, what advice would you give them? Explore lots of options for careers while you are young. Volunteer, do internships, take courses, and find out what interests you. The more activities you participate in, the more well rounded you are and it allows you to find a job you will love doing. It is also appealing to employers to see someone who has been proactive about learning new ideas and skills. Is there anything else you’d like to share about your work or experiences at sea? 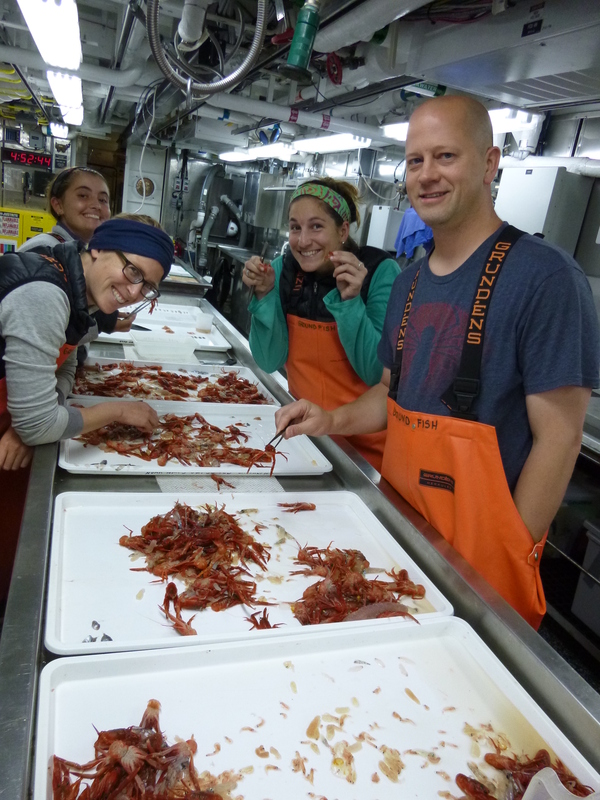 The remainder of the science crew is at different points in their careers and have followed different paths to be a part of this cruise. Students motivated in science can take something from these stories, I hope, and someday join a field crew like this. Chief Scientist Keith Sakuma has been part of the Rockfish Survey since 1989. He started as a student and has worked his way up from there. 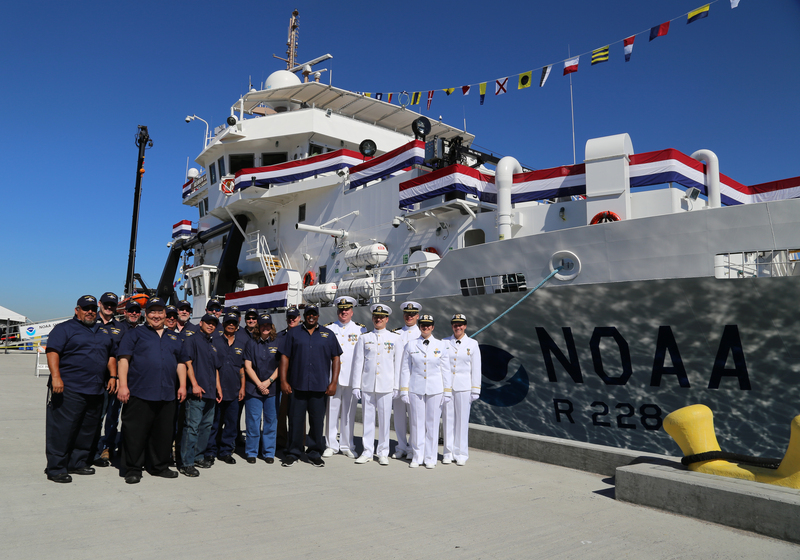 Various ships have run the survey in the past, but the Reuben Lasker, as the most state-of-the-art ship in the fleet, looks to be its home for the near future. Thomas Adams is an undergraduate student from Humboldt State University. He has kept his eyes open and taken advantage of opportunities as they come up. He has been part of the survey for a few years already and looks to continue his work through a Master’s degree program. Rachel Zuercher is a PhD student associated with the University of California- Santa Cruz. 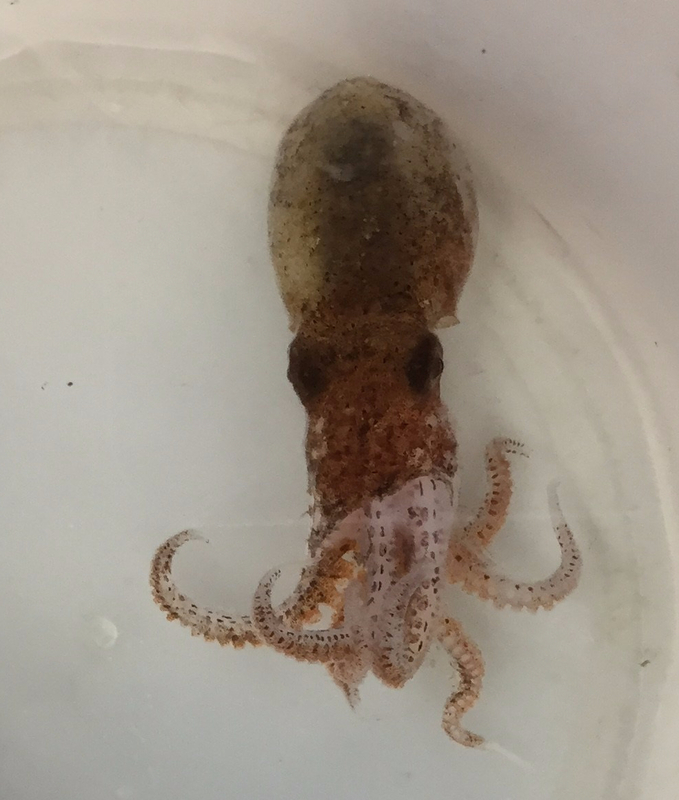 She joined the survey in part because the group has provided her samples in the past that she has used for her research. Mike Force is a professional birdwatcher who was able to make a career out of something he loves to do. He has been all over the globe, from Antarctica to the South Pacific helping to identify birds. As a freelance contractor, he goes where he is needed. 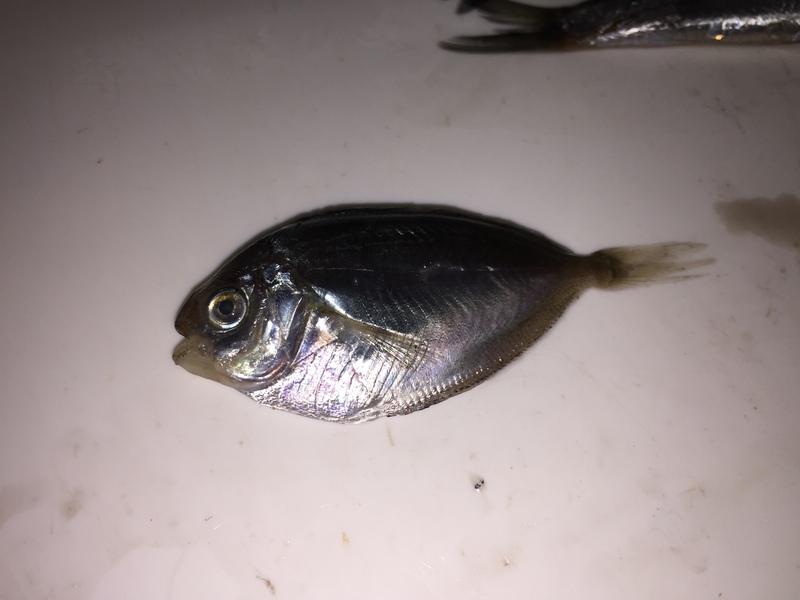 His favorite time at sea was also a common theme I came across- there is always a chance to see something unique, no matter how long you have been on ship. Ken Baltz is an oceanographer who ran the daytime operations on the ship. 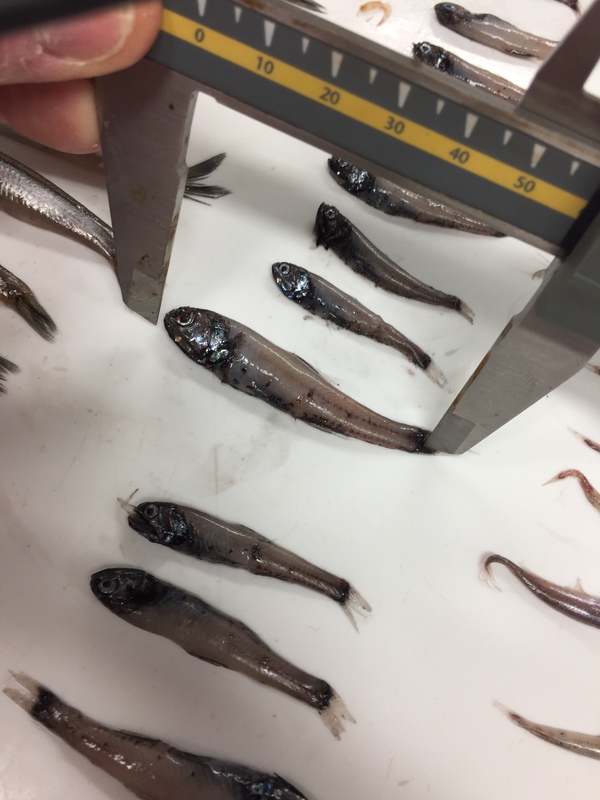 He was associated with NOAA Fisheries Santa Cruz lab – Groundfish Analysis Team. As advice to young people looking to get in the field, he suggests they make sure that they can handle the life on the ship. This was a common theme many people spoke to – life on a ship is not always great. Seas get rough, tours take time and you are working with the same group of people for a long time. Before making a career of life on a ship, make sure it suits you! I experienced a truly magical moment on the Flying Bridge this evening as we transited off the coast near Santa Barbara. For a good 20 minutes, we were surrounded by a feeding frenzy of birds, dolphins, sea lions and humpback whales. It was awesome! The video below is just a snippet from the event and it does not do it justice. It was amazing! Sad to say this is my last night on the ship. We had plans to do complete 4 trawls, but we had a family of dolphins swimming in our wake during the Marine Mammal Watch. We had to cancel that station. After we wrapped up, it was clean up time and we worked through the night. The ship will arrive in San Diego early tomorrow morning. Thank you NOAA and the crew of the Reuben Lasker for an awesome experience!!! 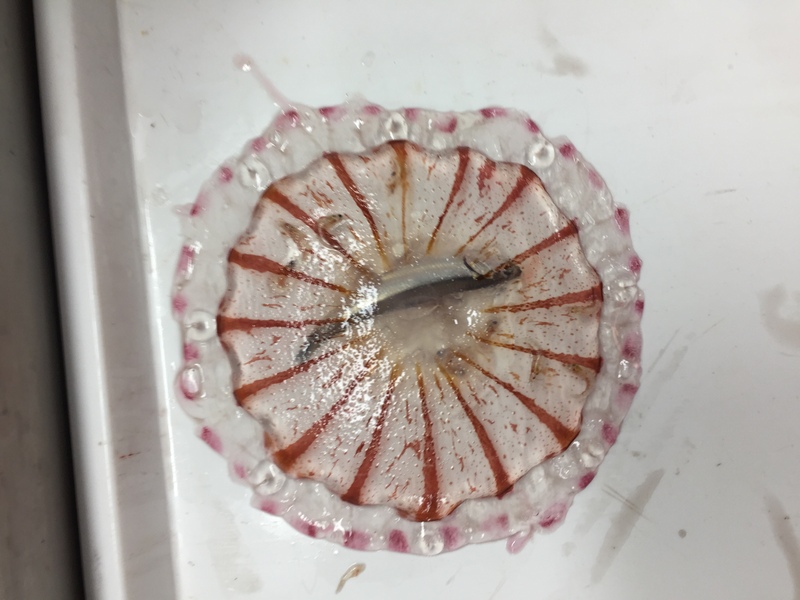 This entry was posted in 2017, David Amidon, NOAA Teacher at Sea and tagged Careers, dolphins, interviews, NOAA Corps, NOAA Ship Reuben Lasker, San Diego, scientists. Bookmark the permalink. Mr. Amidon – so enjoyed reading your blog! It’s a must read – not just for science geeks but anyone who appreciates bettering our world thru science! I learned so much about scientific field work, how demanding and tedious it can be, and how challenging life can be on a vessel. How lucky are the students of LaFayette HS, NY to have such a thoughtful, talented teacher – we need more of you! 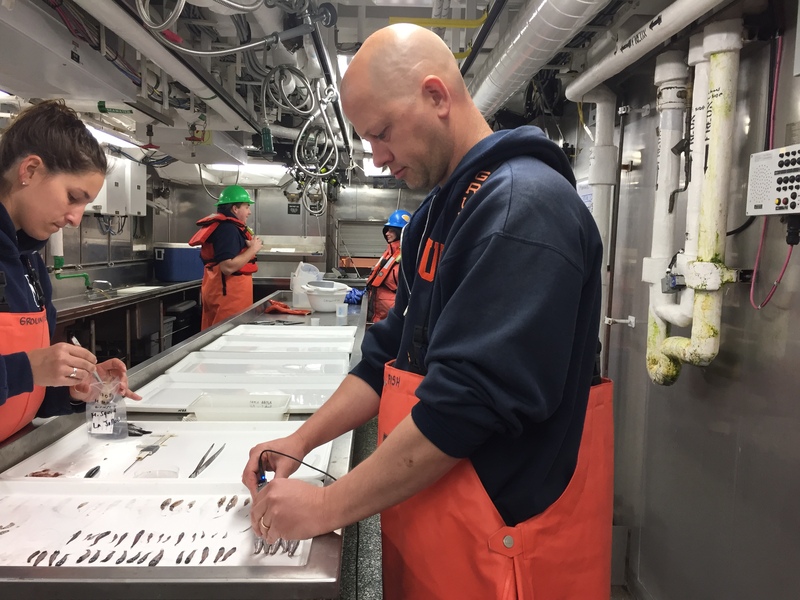 And THANK YOU NOAA for giving Mr. Amidon this amazing experience thru the Teachers at Sea program – giving him a real world opportunity into science field work!